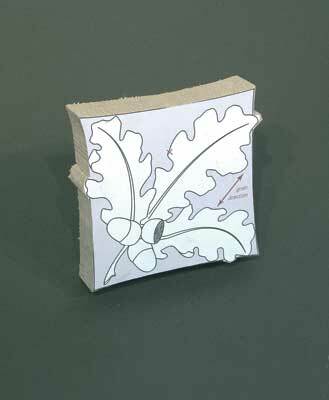 Plants have so much to offer in sculptural terms that it seems a shame they have usually been consigned to the margins of art. 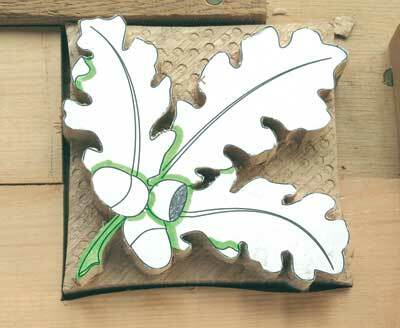 Well, if you appreciate 'things botanical' as much as I do here is a chance to put them centre-stage for the weekend. 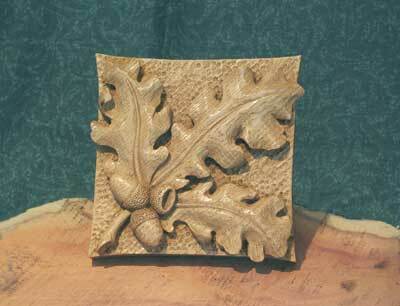 It seemed appropriate to carve this subject in European oak (Quercus robur/petraea). A plank a little over an inch (27mm) thick and 170mm (6in) wide was just right. I looked for a piece in which the growth rings, as seen on the end of the plank, ran across it from face to face, or nearly so. 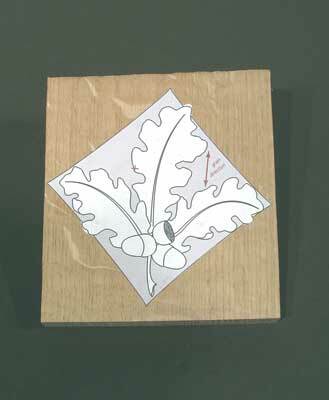 Known as 'quarter-sawn', this grain direction gives oak its beautiful and characteristic pale flares. 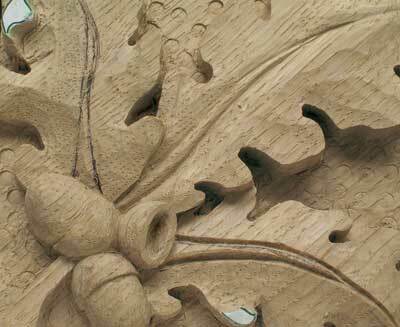 For relief work, I also find it more consistent to carve than other orientations, where the grain changes from an upward to a downward slope at some point across the plank's surface. 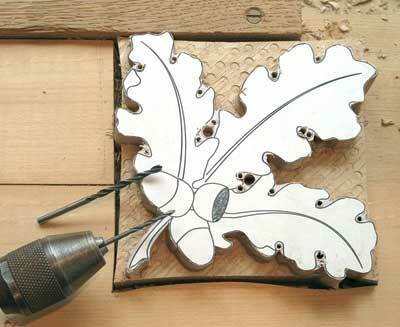 You may prefer to work in lime (Tilia spp), which would be easier and quicker. 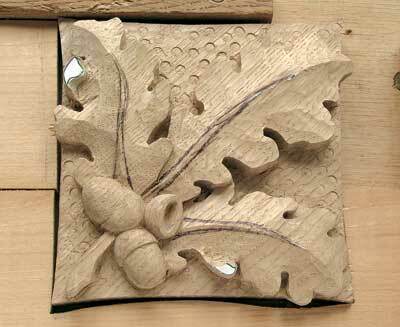 I have found that designs like this carve well and look very attractive in cherry (Prunus spp) or other fruitwoods. If you intend working smaller, it would certainly be easier in fruitwood of some sort. 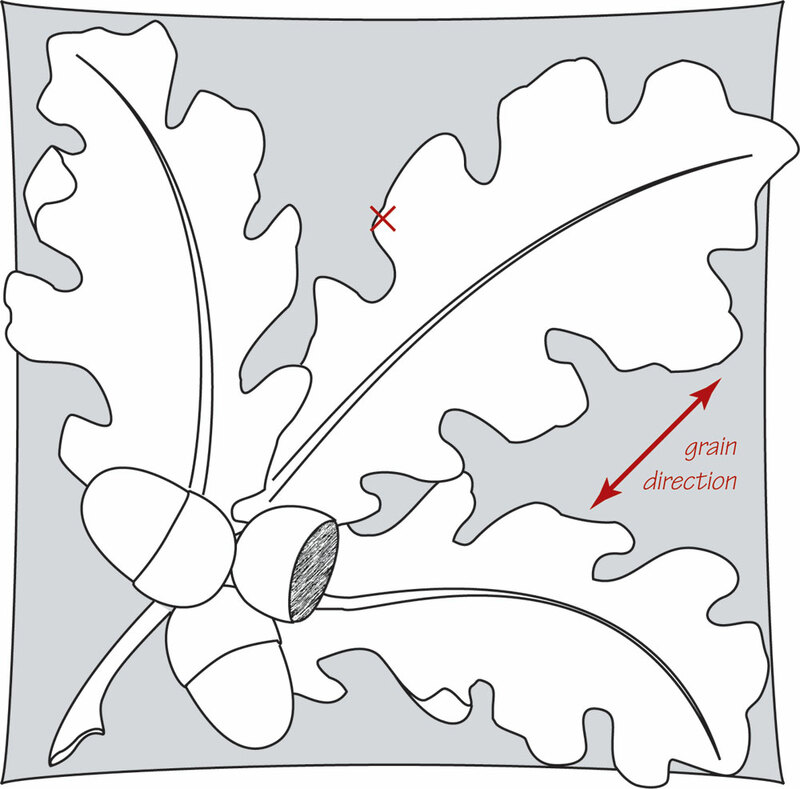 A suggested grain direction is marked on the pattern. 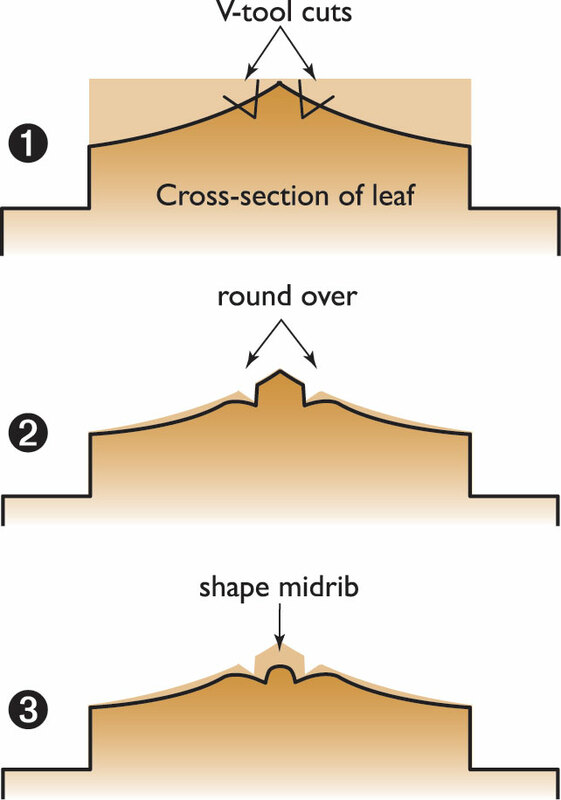 This aligns the stalk and narrow projecting point of the middle leaf with the grain, making them stronger and easier to carve. 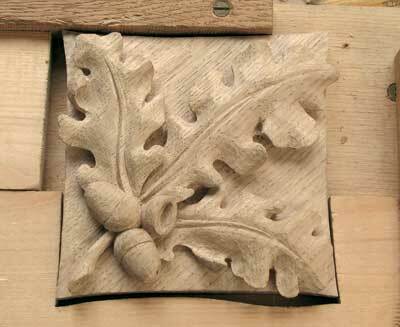 Given the coarse grain of oak, it is probably a necessary precaution but if you are using lime or fruitwood, you could get away with placing the pattern square on a narrower plank. I prefer to see the grain running diagonally on such a plaque, but that's just my taste. Get rid of the excess wood as fast as possible; you've only got a weekend and, as far as I am aware, there are no prizes for endurance. 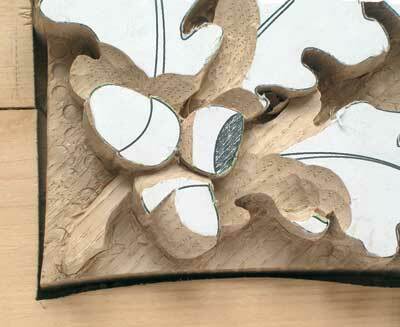 I bandsawed to the outline, but the whole thing is small enough to cut out with a coping saw pretty quickly. Reducing the background is a different matter. 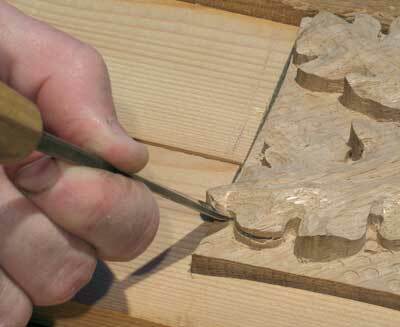 Grounding out with gouges and following the outline is far easier once the bulk of material has been removed. 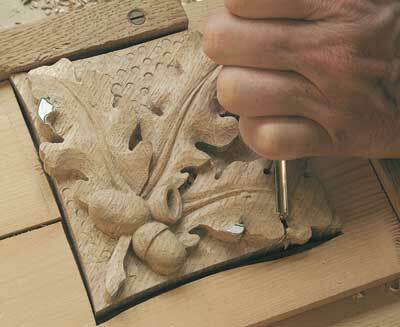 You could secure the plaque and use a hand-held router if you are confident with one. 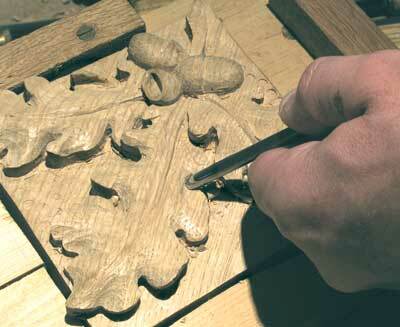 The low-tech (and time-honoured) technique is hand-drill with a piece of tape around the bit to indicate depth, but remember to allow for any point or spur, and you will have to remove these marks which can be quite deep. 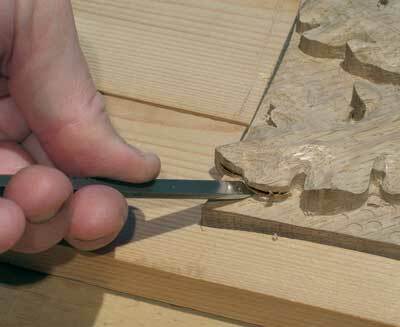 I chose to use a router bit in a bench drill set to a 12mm (1/2in) depth, running at its highest speed. 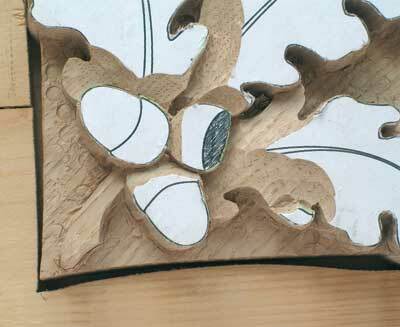 If you start each hole gently it works well, and a small bench drill is cheap and useful if you do not already have one. 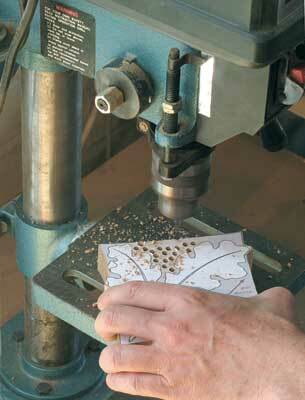 Apart from the advantage of a depth stop, the drill ensures all holes are properly vertical. 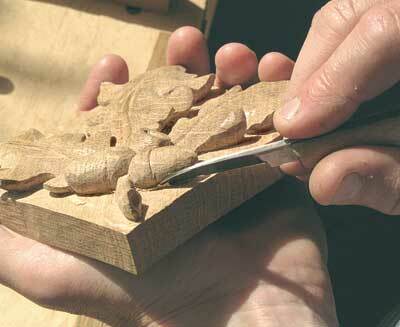 Photo 3 shows how I secure small relief carvings. 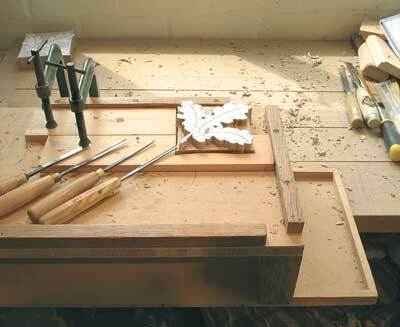 I have a kind of box with no sides that is gripped in the bench vice by a strip on its underside. This raises the work to a convenient height. 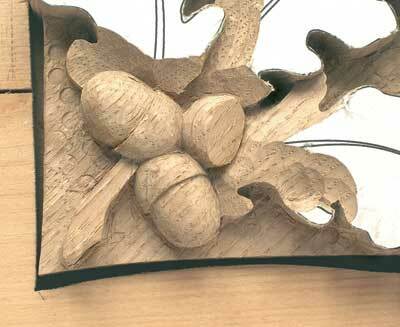 12mm (1/2in) strips on its top allow a workpiece to be wedged or clamped using scrap wood. 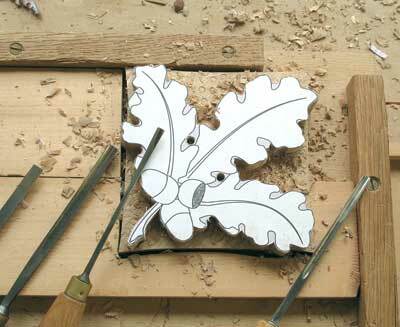 In this case, I sawed a corresponding shape from a strip of pine and used this with a G-clamp to hold the plaque. 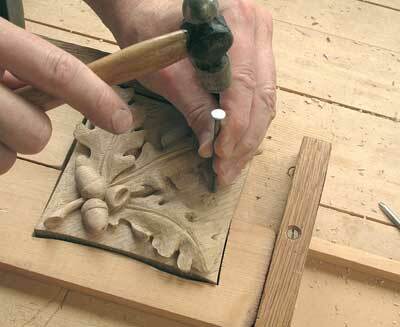 If you are going to put your mark on the back of the carving, or provide for hanging, do so now while the front is still flat. One simple method is to drill two countersunk holes with a tiny pilot hole at the bottom of each so that small brass eyes can be screwed in later and wire strung between them. The red cross on the plan above shows the hanging point. 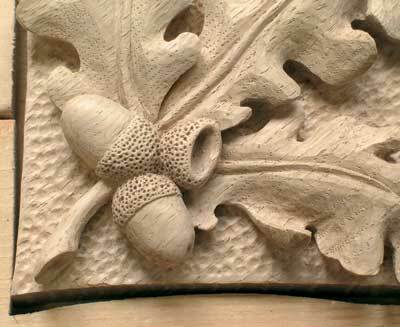 It is a little off-centre to allow for the extra weight on the 'acorn half' of the carving. 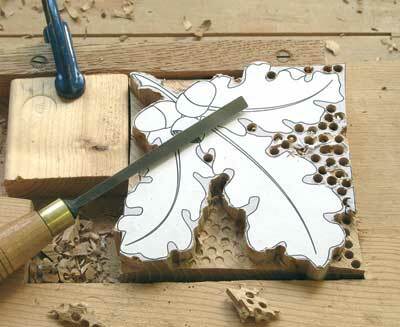 If using brass eyes, the holes should be about 20mm (25/32in) each side of the mark. Running out of weekend yet? 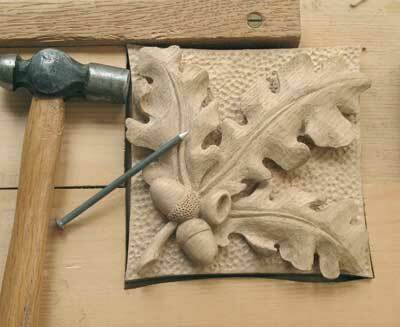 Never fear, all that remains is to rub the whole carving over with very fine abrasive. 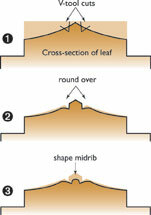 This is not to smooth out tool marks, but just to de-burr edges and polish the surface. I use either the Webrax non-abrasive pads (like a pan-scrubber) or Abranet - worn 400grit in this case. Both can be pushed into corners and do not shed debris like some materials do. Dust off and give the whole thing a coat of thin Shellac sanding sealer. 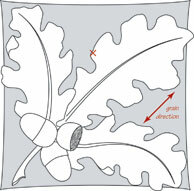 When fully dry, buff over slightly - where sealer appears thick - with the same abrasive, before rubbing on a pale tone of whatever wax you prefer. 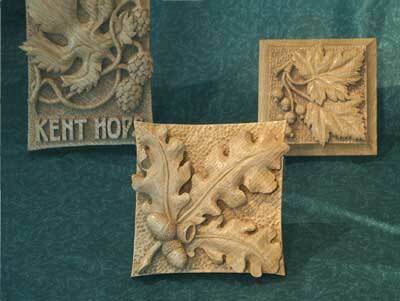 Take care to brush excess off the punched background before it hardens. A final polish and your work is at an end. Time for a well earned Sunday night snooze! 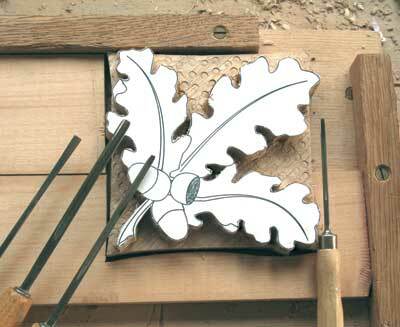 "It seemed appropriate to carve this subject in European oak"
- Try to use the largest gouge that will do the job; it will produce a tidier looking finish - and anyway, it saves time!